Water hyacinth, sometimes called the World’s Worst Water Weed, is becoming invasive in the Lake Tanganyika basin and on the shores and wetlands of some parts of the lake. An invasive species is an animal or plant which is introduced into a new area where it does not occur naturally. If the introduction occurs without the accompaniment of its pests and diseases that keep the species in check (under control) in its natural range and if it is able to survive, establish and spread thus causing damage to biodiversity, peoples’ livelihoods or development, it is called “invasive”. Water hyacinth (Eichhornia crassipes) is an exotic free-floating aquatic plant from the Amazon River basin in tropical South America. The dark green, shiny leaves have expanded hollow stems (petioles) that enhance its ability to float and can extend to 2 m above the water level. Below the water surface, there are root-like structures (rhizoids) which balance the plant and keep its aerial parts upright while taking up water and some nutrients. It reproduces through flowers and seeds (which can remain viable for up to 15 or more years) and has vegetative propagation by its stolons which are lateral extensions from the main plant which produce new plants which eventually leave the “mother plant”. The floating plants and the mats they produce can also provide habitats for dangerous animals (snakes, crocodiles) and can support other aquatic plants that then form “floating islands” that can block water flows and damage machinery - such as hydropower turbines. 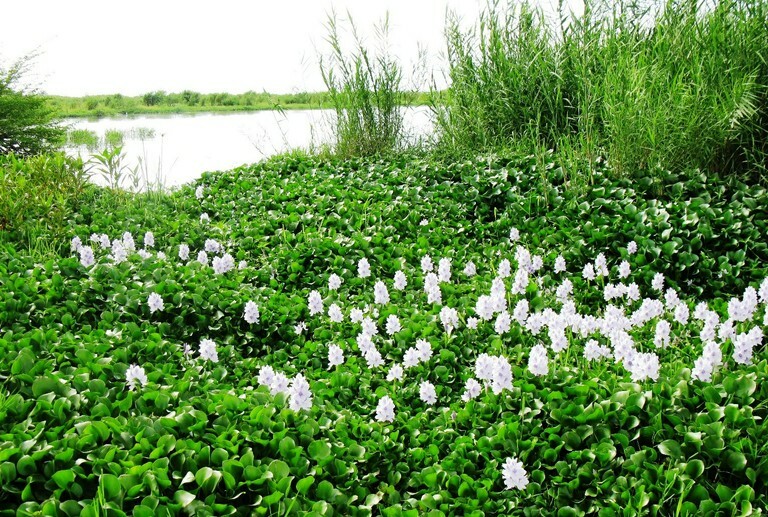 Water hyacinth requires some dissolved nutrients in its waters to grow and spread. Thus effective control of water pollution from agricultural run-off, rural and urban drainage and insufficiently treated sewage should be maintained to ensure that if there is a first infestation, it is unable to grow into a significant water hyacinth invasion. Water hyacinth is present and invasive in wetlands and swampy shorelines around Bujumbura and other parts of the Burundi shoreline. This is a recent invasion which entered the lake in the late 1990s and has spread widely – to the detriment of other aquatic plants, fish, other aquatic animals and people. We do not have records of lake-side invasions in the other riparian countries of the lake (DRC, Tanzania and Zambia) but are aware that this water weed is present in other parts and catchments of all three countries – and in upland wetlands and lakes in Burundi as well as in Rwanda. Eichhornia crassipes is quite able to spread across the lake and establish in suitable sites – but does not seem to have done so – YET. 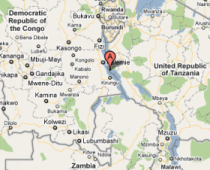 Water hyacinth came to the lake from infestations upstream in the Rusizi River and from “water gardens” where the plant was growing in cities and towns near the lake – where it was kept for its attractive foliage and beautiful flowers. Once it is established in a wetland or water body it can spread through wind propulsion of floating plants (or plant fragments), through water currents and on the feathers and feet of the numerous species of local and migratory waterbirds. In other countries in Africa it has been spread by people – as a green cover for dams and other water supplies; and as packaging for fresh fish on their way to far-off markets. What is my role in controlling this invasive species and so retaining the benefits of Lake Tanganyika? It is inadvisable to make any economic use of cleared plants of water hyacinth as this is likely to give this plant economic value and so stop its control and management. If utilisation is desirable or congruent with current national policy then carry this out in drainage basins far from Lake Tanganyika. IUCN Global Invasive Species Initiative, IUCN ESARO Regional Office, Nairobi, Kenya.